I looked around my office as I pondered how to assemble words to mark the end of 2008 and the beginning of the New Year and I started to smile. My fly tying vise was sitting next to my lap top. A compass sat next to a stapler. 2008 fishing licenses sat next to my Treo. My office table was covered with flies, pliers and other tools, reels, magazines, sketches, hats (tons of them) and sunglasses plus other such sundries. Under the table sat a collection of prototypes and gear. In front of me, a variety of pants, shirts, sandals, belts, neoprene gloves and small stuff from t his past year’s developments was piled high. Sitting nearby was a piece of snake skin, a pinecone and some beach stones. Other scatterings included duffels sitting next to reusable envelopes/shipping supplies and a color chart over a rod rack. What struck me as I looked around was how it appeared (to me at least) to be a well balanced menagerie. Where there was Ying, next to it sat Yang. Though many might look at the same scene and see clutter. For me it clearly marked 2008 as a busy, productive, well balanced and energetic year. I would like to express my gratitude to all of you in the Way Upstream community who have made contributions, shared opinions and been involved in 2008. There was rarely a dull moment. I look forward to 2009 with optimism. I think it will be busy, productive and energetic too. Happy New Year. Now I think it’s definitely time to clean my office. Happy New Year EP and Way Upstream! Here is to another big year in 2009!! Best wishes to everyone and peace on Earth!! Happy New Year to you to IT Guy. Thanks for all your contributions, advice, technical and moral support. Onward into 2009! Thanks for the note Alistair. Lots of new designs are coming for 2009. I hope we can connect in Montana again this year. I'll be in touch. Happy New Year! No pizza boxes or donuts in these shots Taku but that doesn't mean I'm not a fan. I'm a amateur pizza chef on the side and there's a little farm stand around the corner that makes the best cinnamon donuts every morning. They are part of my morning striper ritual. Happy New Year! Sounds like the pics and the comment attached are a fun way to justify a mess!! Just curious - is Patagonia bringing back the fly fishing-specific catalog? 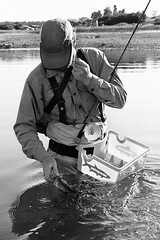 The Patagonia Fly Fishing specific catalog is BACK! I believe the drop date for this piece to be just weeks away Bradley. Unfortunately I'm not sure if you will be able to request this catalog online but I will look into it. Any chance the FF catalog will be available as a PDF? Good thinking Anon and Taku. Team Fish is investigating ways to use the files created for the FF catalog not just for enviro reasons but also because there will be a very limited print run. I love pdf's! Less paper! Experimentation has begun Nora. Signs are looking good. the items online. Let us know if you have further questions. Sorry p.MD. Though the fishing catalog is back, there is a specific mailing list for which all paper copies have been allocated. Team Fish hopes to unveil an online version of the catalog shortly after the paper catalog ships so that everyone can have access to it. I will update you when I know more.